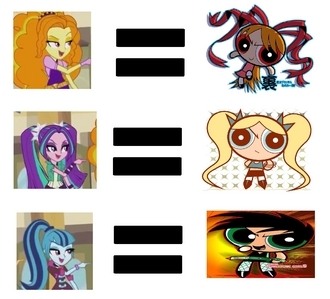 Do wewe think that the Dazzlings are the Powerpunk Girls? I feel like they are, cause both trios are evil, and the Dazzlings and PPNKG are popular, do wewe think that the Dazzlings are the Powerpunk Girls? No. The reason I say this, is because they're different people. The Dazzlings maybe similar, au have similar goals, but that does not make them the Powerpunk Girls. Adagio would be like the fairy in red, Flora. They are both the leaders of their trio and make the plans. Sonata would be like the fairy in green, Fauna. Both are the most likable member of the bunch, as well as unexpectedly cute. Finally, Aria would be like the blue fairy, Merryweather. Both do not take ng'ombe from others, and are annoyed kwa some insolence. Also, the two may be seen as aggressive. Of course, wewe may disagree, but this is what I think of. They're zaidi like the Kanker Sisters from Ed, Edd, and Eddy. Adagio: Leader and meanest of the three. Aria: Kinda like Adagio, just not as mean. Sonata: Acts kind of ditzy, au at least that's how the media portrays her. And her "obsession" with tacos is an annoying misconception, like Derpy with muffins. Neither are true. How do wewe know it's a misconception?